We are seeking to develop Ubuntu Villages in towns and cities across the US and the world in areas that are economically depressed. We define community, as being any person that participates in community projects by volunteering 3 hours per week up to full time involvement. Members of the community are located within a close proximity to the created businesses and wellness center, however the goods and services are available to be purchased by anyone. 1) volunteer 3 hours per week doing assigned tasks in return for the goods that the community creates. Community members are encouraged to learn new skills from the "Masters" of the community who can teach them skills that will be used in the created businesses. We will create vocational classes at no cost to community members, to learn and practice technical skills. This is the path to transition someone from their current day job (or unemployed), to being a skilled and valued paid worker in the community businesses at higher than minimum wages plus profit sharing. 2) Qualified Full Time worker that has learned the skills to do a job through our teaching program that earns above minimum wage and also profit-sharing. Investors receive 25% of the profit sharing pool. As the venture increases in revenue, the investor should also share in the success. It is the investor's belief in what we do that enables us to reach the level of abundance that we strive for. Community members who are full time staff receive 25% of the profit sharing pool. Our minimum wage is $12/hr. As the products and services increase in profitability, those that were directly responsible for the success will share in the profits. The goal for the Community Members is to become debt-free. The Community Fund receives 25% of the profit sharing pool. The Community Fund covers the expenses of a Wellness Center, daycare, and education programs. Community Services are not profit centers and are funded from the 25% profit sharing allocated to the Community Fund. We strive to have healthy mind and body and to use advanced medical technology and holistic-based approach to wellness to elevate everyone in the community. 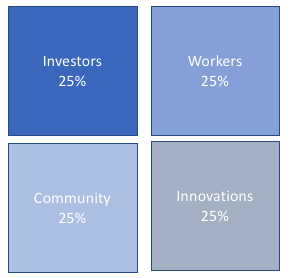 Innovations receives 25% of the profit sharing pool which will be invested to create additional businesses for the community or to create new ventures in new communities. Our goal is to replicate this model in as many communities and cities as we can.